The long awaited Venus transit - first since 1882. 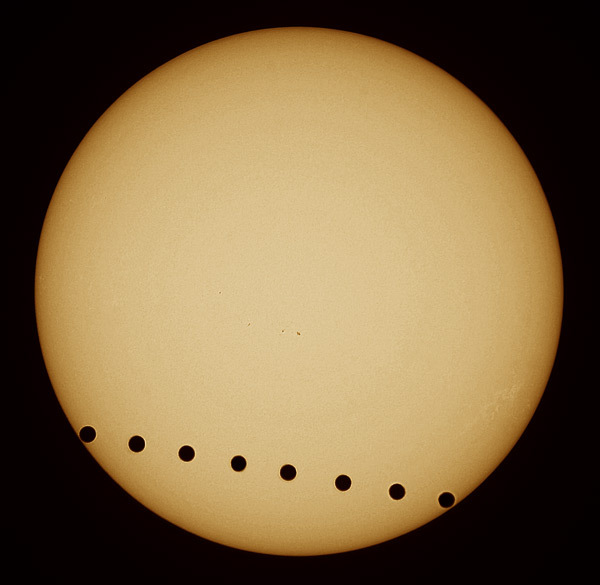 The Venus transits have been used in the past to calculate the distance between Earth and Sun. 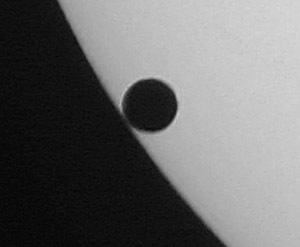 Several effects have been reported, such as black droplet during second and third contact and light rings indicating the atmosphere of Venus. no black droplet can be observed, the silver ring around the limb of Venus could be an artefact from sharpening. At bottom a sequence with the webcam showing the 3rd and 4th contact in higher resolution. In some of the frames faint traces of a short light arc are visible. The last frame of the animation is strongly overexposed and shows Venus with a faint diamond ring, caused by refraction and reflection of the solar light in the atmosphere of Venus. Date June 08, 2004 05:10-11:25 UT.